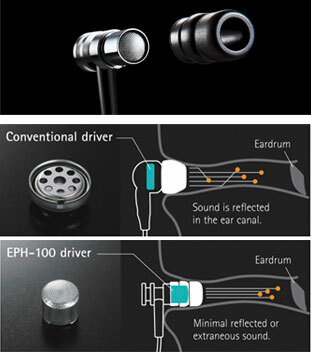 The EPH-100 features a 6mm (1/4”) diameter super-compact driver that can be inserted straighter and closer to the eardrum than ordinary earphones. This allows you to hear pure, low-distortion sound without unwanted sound reflections. You enjoy natural, accurate reproduction with all sound sources. The earpad has a two-part flange; the first part smoothly guides the driver into the ear, and the second fixes the earpad firmly in your ear. Tightly sealed for minimal sound leakage, it lets you enjoy powerful bass sound. The snug fit ensures optimal comfort. You can choose from among five earpad sizes to suit your ear size and preference, ensuring maximum comfort as you enjoy your music. Clear Sound with Sharp Definition. The body is made of high quality aluminium, exceptionally light and hard, it provides a good feel while helping to minimise sound loss. Air outlet holes in the driver unit and exterior adjust sound quality and provide optimum sound emission with sharp definition. When carrying the headphones in your bag or pocket, they are firmly attached to the base of the plug. The smart cable holder prevents tangling so the cable can be smoothly taken out and used. In addition, the cable is made of elastomer material that resists kinking or curling. 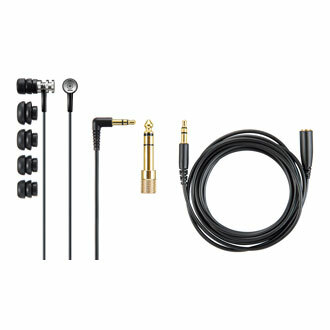 The gold-plated, Lshaped plug is designed with priority on sound quality.